Matt: I hear it's restaurant week. me: I hear it's BREASTaurant week. Matt: You don't hear that. You just wanted to type "breast." Soooo... what's in the news. Everyone's going crazy for this new Apple iPad! me: I say that pad's not going to absorb any menstrual blood. me: Obama's doing a spending freeze. Have a heart Mr. President. Send your money to Miami! me: Seriously though, you've been a terrible audience. I'm gonna take a break and go to the bar, but I'll be back in 15. Be glad I don't have your gmail address. My show, 9 AM Meeting has a new website. Why not check it out? Whim Quarterly--the world's quarterliest humor magazine--asked all contributors to fill out a survey adapted from the gripping, must-read social work book of 1917, Social Diagnosis by Mary Ellen Richmond, and as of right now, I am the featured writer. Read my snappy answers to outdated questions over on the Whim website. Is this the only time three grown men watched Hannah Montana: The Movie and it wasn't creepy? (Answer: with Stuart involved, it's always a little bit creepy.) We spend more time discussing it than the writers spent writing it. Meanwhile, Dan questions the whole premise of teen-by-day/ pop-starlet-by-night, Stuart redefines topical humor, and Elliott re-imagines the movie as a taut psychological thriller. 0:35 - 3:00 - We welcome Elliott back and, for some reason, Stuart wastes time quizzing him and Dan about current events. 3:01 - 37:24 - We discuss Hannah Montana: The Movie, because surely the audience for that picture was white males in their late twenties to early. 40:28 - 53:49- Our longest letters segment yet, resulting in one of our patented vague Flop House contests. 53:50 - 56:49 - A very short sad bastards recommend. 56:50 - 58:14 - Goodbyes, theme, and outtakes. Mr. Whitepants at the UCB Theater this Friday! Come celebrate being awesome with us! Against all odds and common decency, we've made it to a year. That's cool, right? The best and the oddest from three heavy-hitting sketch groups. 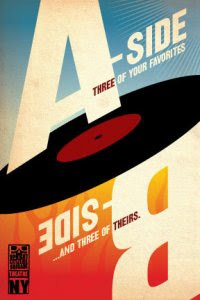 We bring you the crowd-pleasers you know (A-sides), and the uncensored material you'll never forget (B-sides). Hilarious and strange, come get a look into the minds of sketch comedy's most innovative. part of "A Side/B Side"
307 W. 26th St. between 8th and 9th Aves. Mr. Whitepants' Comedy Hour - 1 Year Anniversary Best-Of Show! If this is Dragonball: Evolution, we'd hate to see Dragonball: Neanderthal (this joke contributed by Milton Berle's secret joke file). Meanwhile, Dan tries to fill Elliott's tiny shoes, Stuart discusses the career of Ernie Hudson, and Nigel sounds 10% smarter than either of them. 0:37 - 3:47 - We introduce our guest co-host, Nigel Wood. 3:48 - 29:50 - We discuss 90 minutes of bright colors, loud noises, and disconnected action, in a DVD mislabeled "Dragonball: Evolution." 34:31 - 41:46 - The sad bastards recommend. 45:47 - 45:02 - Goodbyes, theme, and outtakes. 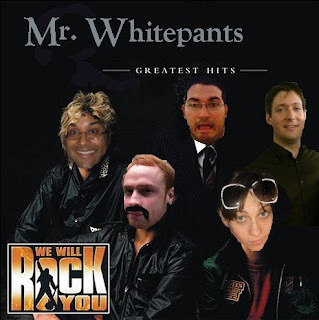 Mr. Whitepants Returns to the Creek TONIGHT! Why not celebrate the fact that you didn't get alcohol poisoning on New Year's by coming out to our sketch show tonight? Mr. Whitepants' Comedy Hour at The Creek in Long Island City 10-93 Jackson Ave. Queens 6pm, Saturday, Jan. 2 Free! 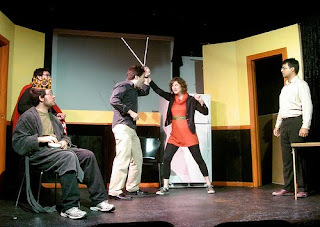 Here's a picture of one of the many sketches we won't be performing tonight!